A recent and most charming garden visitor couldn’t help but exclaim at a sight in what we call The Sunken Terrace. Not, alas, out of sheer delight, but out of consternation at seeing clashing pink and orange roses floating in a garishly terracotta coloured plastic trug. That made me chuckle, though not at their apparent colour sensitivity. According to a date etched in a discreet corner, the pink and orange concrete patio inherited with the house was painstakingly laid in 1981. It’s vast, and, some 35 years later, it remains eminently serviceable. Thanks to Aina’s remarkable workmanship it’s firmly stuck down, and, thanks to our budget, we’re firmly stuck with it. The slabs were chosen to match the orange roof tiles of the house and barns surrounding the patio, in turn used locally as a compliment to the local sandstone that is naturally a mottled reddish grey. At any rate, it’s certainly a child of past times! In summer we like to think of it as cunningly cloaked by the planting; in winter, it’s true colours and scruffy nature are revealed. And, it does look a bit grim. In 2007, having rennovated the huge weed infested herbaceous border that had once been a trout-pond-come-swimming-pool, we zealously power washed the patio. The day-glow result was far more offensive than the ameliorating patina of lichen and grime that had taken years to accrue. I promptly resolved never to wash the unlovely concrete steps leading to the sitting room : the bonus of a grey wet summer is that they sport delightful mossy patches. Geranium ‘Sanne’ lines the steps, it’s brown leaves flare orange in late summer. We’ve learned to embrace the ramshackle look. Initially, the newly washed patio did very little for our collection of planters, mostly in hues of purplish blue. Chosen to look good on silvery bleached wooden decking of a London flat, they and the lavenders looked at odds with their new surroundings. 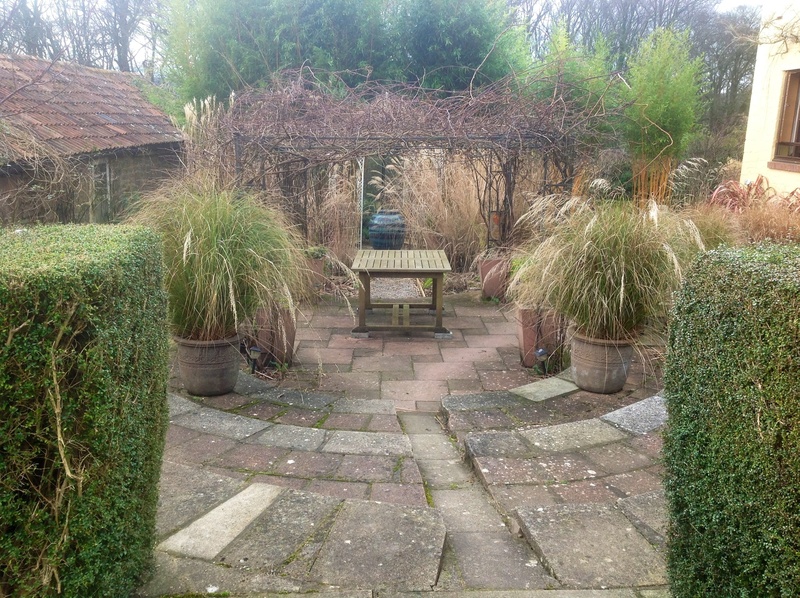 The lavenders being such, have conveniently long since died, to be replaced by fountain shaped grasses (of course!). 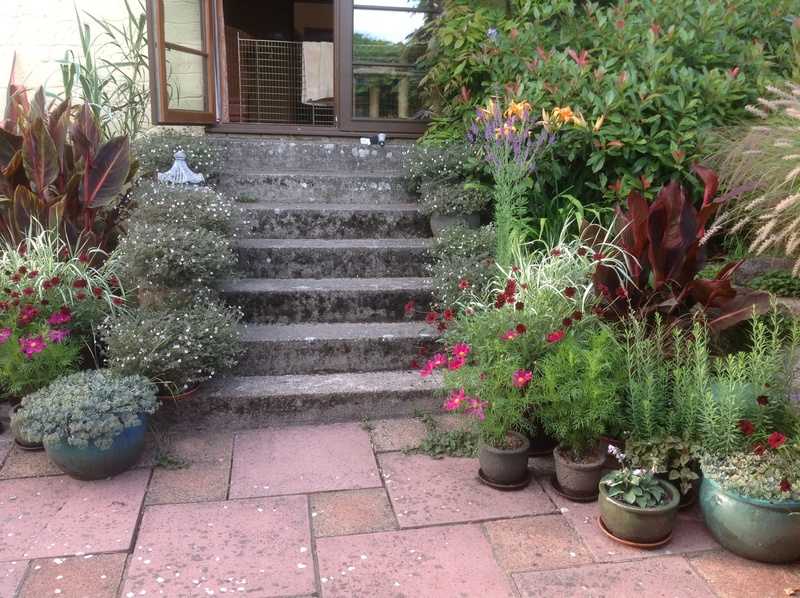 The pots sitting at the edge of three broad semi circular steps leading down to the terrace predate Aina’s work, in May this year we discovered from Aina’s daughter that these were built in the 1970s when Barn House was a commune, set up by Phillip Toynbee. Only the bronze urns either side of the wooden bench were a match for the candy coloured slabs. 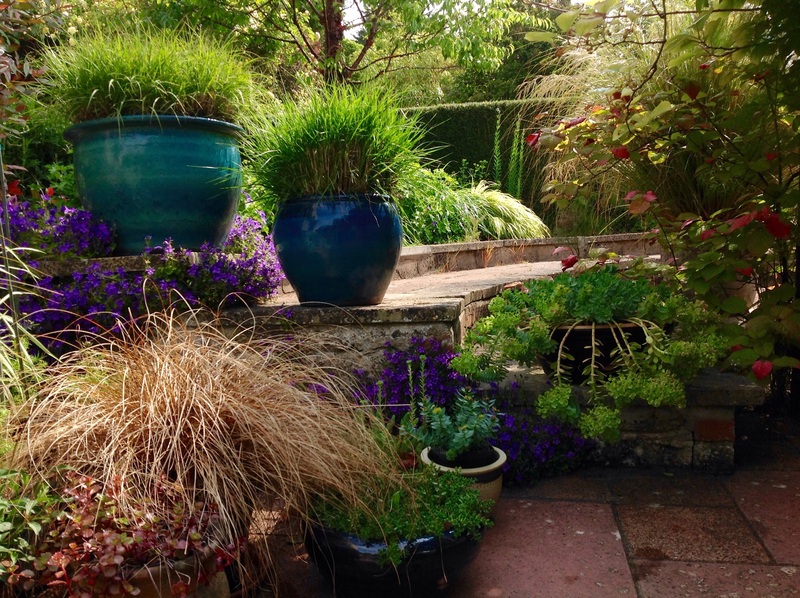 Since then, any newly purchased pots have been selected to blend in with the hard landscaping, very often they are made of reconstituted stone dust. The dingier, the better! Some are even orangy pink themselves, perhaps, not pots we’d have raced out to acquire if we didn’t own this particular patio. Chioncohloa flavicans graceful habit and elegant flowers, with a slight orange glint in its leaves, does a great job of diverting attention from the otherwise ugly concrete, and, as a sterling evergreen grass it’s an effective decoy throughout the year. Actinidia Kolomikta is a bit of fun with its chameleon coloured first orangy green, then white, then pink splashed foliage. Having learned not to argue with the strident hard landscaping, when it came to planting up the new pergolas that add height, structure and shade I selected half climbers, garish pink and orange roses. Planted in pots, the roses don’t seem to mind sharing their quarters with self seeded bronze fennel and the wanton sugary pink Geranium ‘Jean Amour’. It’s a delightful fluke, also concealing the off season sulks to which the otherwise lovely ‘Zephryn Druin’ is prone. 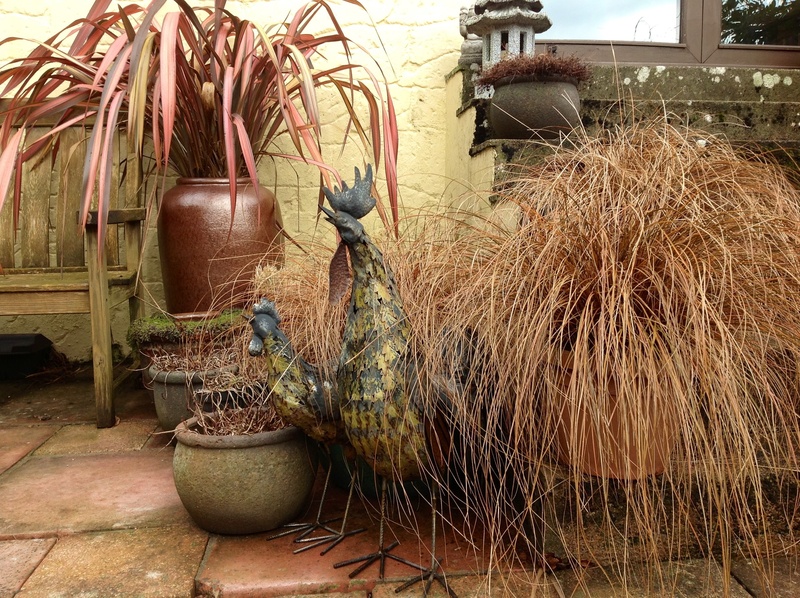 Wonderfully, Aina’s work has led me astray, from my natural inclination for more muted tones, now the planting is anchored in bold yellows, reds, and cerise – colours that pack a punch and celebrate a zest for life. 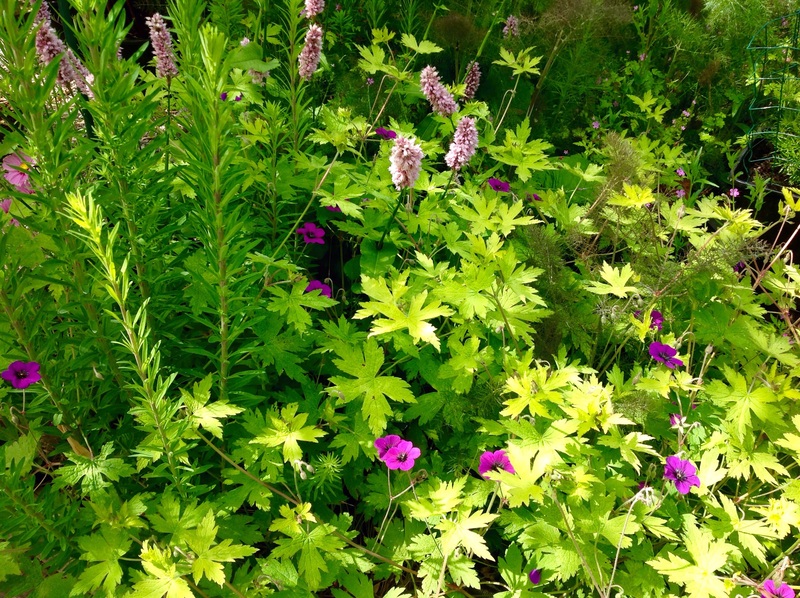 One particularly useful addition to the psychedellic palete is indefatigable Geranium Anne Folkard, not just for zingy flowers but also for lime-yellow leaves. I love this happy wanderer for the way she weaves among her bedfellows. She’s such a gentle flirt. 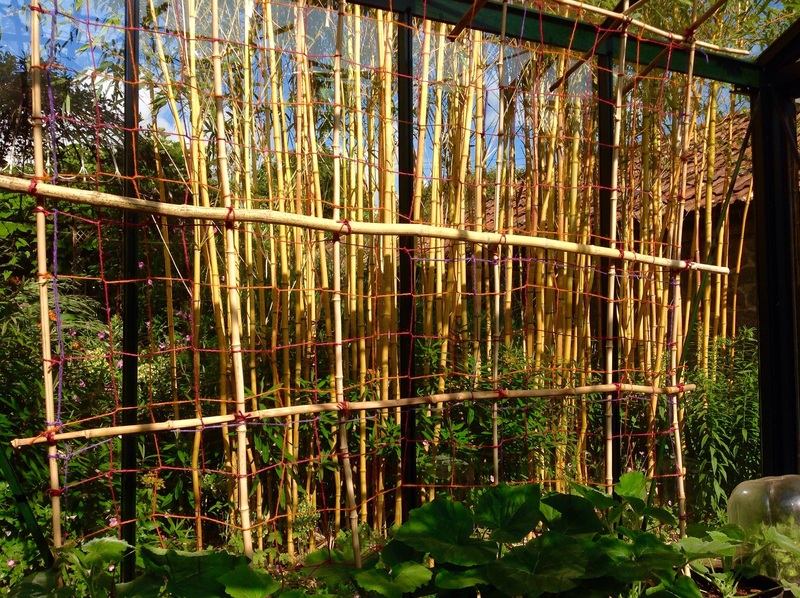 And, yes, we’ve grown to love the pink and orange patio, especially for the exuberance of its late summer exotic display … …and, yes, we’ve had some fun with it along the way, like this year’s pink and orange cargo net in the greenhouse …. You blended so beautifully the old skeleton of the garden with the new, East and West came so peacefully together. 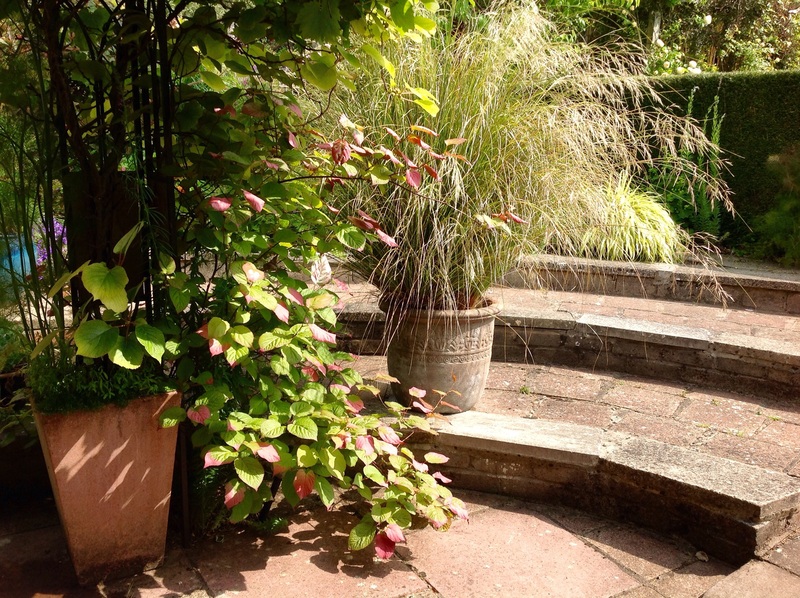 … but, most of all, it gladdens my historian’s heart to understand the patio’s provenance, and, as makers of this garden, Hitesh and I are grateful to Aina, who visited the garden incognito on the garden’s first NGS open day in 2013 and, afterwards, wrote those kind words. I think, when we redo the garden plan, we shall proudly label it The Pink and Orange Patio. Bless you, Aina, for the inspiration. ‘Rest in peace’. You have some wonderful design ideas and a great eye for colour. I am delighted to have found your blog. Chloris, thanks both for the kind comments and for following the garden journal. I’ve enjoyed reading so many great blogs, yours included, as well as gleaning ideas in the process. Love your scarecrows! 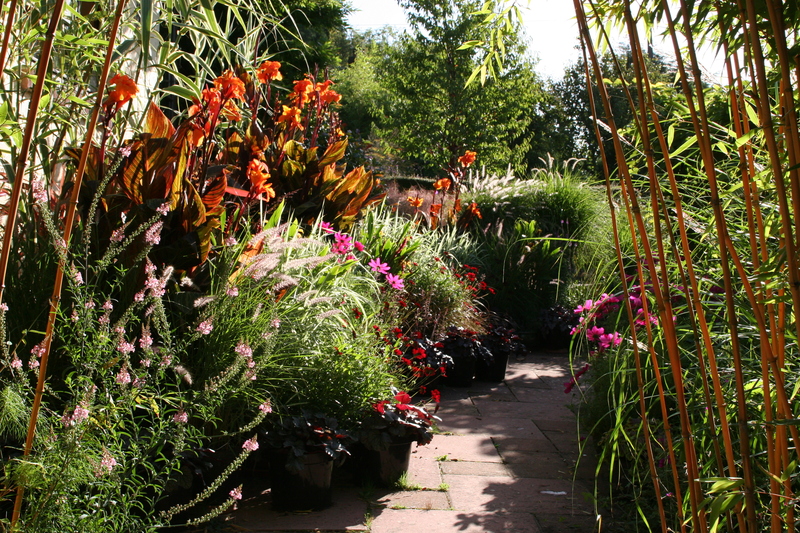 Your photo of the cannas, bamboo and cosmos looks fantastic. Purple is good to allow back in. I’m glad you approve of purple too. Thanks for the complement re pic of the ‘hot pots’, most of the images are quick snaps taken on the run with an IPad. I got lucky with that one. Having inherited what seems like acres of raw slab concrete I can sympathise, especially as we made the fatal mistake of pressure washing too! Unfortunately in wet Devon, on a hill, all that concrete becomes treacherous in winter so there’s no alternative really particularly as I hate using chemicals. Pink and orange is a great combination. I’ve started using it on the bank.. It’s a good way of ensuring the blooms show up from a distance! I have learned to love the way the these colour combine and draw the eye. I think pink and orange will make a great hightlight on your wonderful looking bank.